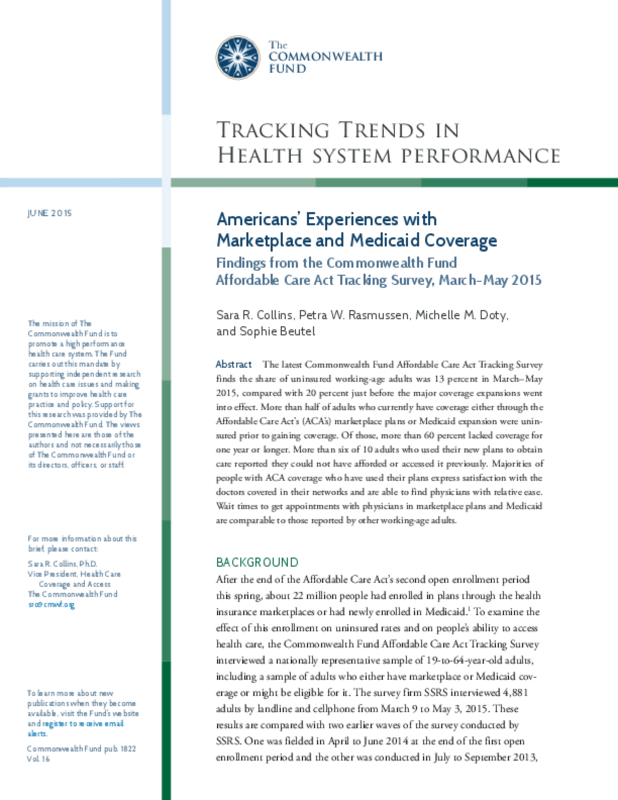 The latest Commonwealth Fund Affordable Care Act Tracking Survey finds the share of uninsured working-age adults was 13 percent in March–May 2015, compared with 20 percent just before the major coverage expansions went into effect. More than half of adults who currently have coverage either through the Affordable Care Act's (ACA's) marketplace plans or Medicaid expansion were uninsured prior to gaining coverage. Of those, more than 60 percent lacked coverage for one year or longer. More than six of 10 adults who used their new plans to obtain care reported they could not have afforded or accessed it previously. Majorities of people with ACA coverage who have used their plans express satisfaction with the doctors covered in their networks and are able to find physicians with relative ease. Wait times to get appointments with physicians in marketplace plans and Medicaid are comparable to those reported by other working-age adults.